Please refer to FGCom_3.0 instead. This article is obsolete but is kept for historical reference. Of course the prerequisite for the following is that you have already installed the FGCOM (see the FGCOM-main-page) ! 1 The Initial test of the standalone FGCOM Installation --> the so called "-f910 Test"
The Initial test of the standalone FGCOM Installation --> the so called "-f910 Test"
Due to technicalities it is not possible to speak from 1 server to the other - so try one and change if you notice that your friends are using the other. You do not need any Login-Passwords and/or User-Names !!! Speak into your microphone and your words should be echoed back with a short delay. e.g. say "one" - and you should notice that the "one" is returned after you finished speaking it. and continue with the next chapter: Test the FGCOM together with the FlightGear Simulator. "The procedure entry point alcCaptureSamples could not be located in the dynamic link libary Open AL32.dll." Be aware that the versions and also the names of the modules may change -- so please always check also the description of the module at the right side on that http-page! The System cannot find the given path. The command "fgcom.exe" is either mistyped or could not be found. The system is right: I gave it (for testing) a wrong directory! You better correct yours prior to retrying! typed a small "-sfgcom..." instead the capital "-Sfgcom..."
or you may have created your own unique "typo" (lol). If you use a firewall (what you should - out of general safety reasons!) make sure the ports below are enabled for your PC. check the directory in which the FGCOM is installed for the files "phonebook.txt" and "positions.txt". These are normal text-files in which you can add missing information with a standard editor, for Windows you should use the "WordPad" (not the "Editor"). Replacing a complete "Windows" position.txt with a "Linux" one can lead to errors, although lines of both files may be exchanged/added. otherwise check the Internet for new drivers for your sound-card or other fixes. In the forgoing chapter you checked the FGCOM as a standalone application. Now we will test whether the FGFS (FlightGear Flight-Simulator) itself and the FGCOM work together, inclusive the PTT-button (PushToTalk, usually the space-bar) and the internal connections via the assigned ports. click in the FGFS menu-bar onto "Equipment" --> "Radio Settings"
Ensure the FGFS is the active window: if something does not work out as expected click with the mouse somewhere into the Main-FGFS-window (that will activate the window) and then retry the last action(s)!!! This indicates a pure Port/Interface problem between the FGCOM and the FGFS. also change the value in the FGrun (“Wizard”) → Advanced Options → Input/output to 5004 or add the option "--generic=socket,out,10,localhost,5004,udp,fgcom" to your FGFS start-command. anyhow make sure all these 3 places contain the same Port-number !!! Push the PTT (normally the Space-Bar (if you reassigned the PTT to another key - use that one!)) and speak into your microphone: "your words should be echoed back with a short delay. e.g. say "one" - and you should notice that the "one" is returned after you finished speaking it. keeping the PTT pressed for about 3 sec and watch for a possible start of "funny noises". otherwise switch your COM1 back to the frequency wanted --> continue with the next numbered item. Otherwise check the “YourPlane-set.xml” file in your FGFS/data/Aircraft/YourPlane directory: If you find a line <key n="32"> then this plane is intentionally using "key 32" (Space) for something other than the PTT. Known planes that do that as of Feb. 2009 are: an2, bluebird-base, ogel, OV10.., seafireIIc, spitfireIIa, ufo. There could be others. Finally we will adjust the Microphone and Loudspeaker volumes to an optimum, as well for yourself as also for your fellow players. Start your FGFS and FGCOM as described in the forgoing chapter(s), the COM1 must be switched to 910.00 and be the active one. Talk into your Microphone and verify the delayed feedback. If this does not function as described before, repeat the forgoing chapters. While talking into the microphone adjust your loudspeaker so that your echoed voice is understandable, but not any louder than required. Now adjust your microphone volume from 0 to full. Somewhere in between you will find a spot at which the returned echo-volume will not increase according to the microphone-volume changes. Leave the volume just a little below that point. After the microphone is set, adjust the loudspeaker volume to a level you prefer. 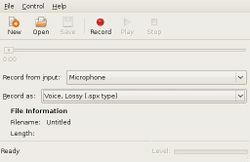 Finally verify both settings by keeping the PTT pressed for about 10 seconds without talking and/or feeding any other sounds into the microphone. listen for "funny noises" building up over time (hard to describe: some "unverified whoosh" and maybe additional even some sound like "air in a water-pipe" - actually: Whenever you hear anything --> it is no good!!!. but also a rather high adjusted speaker-volume may cause such "funny noises" - try reducing the loudspeaker volume if you cannot solve the problem by adjusting the microphone and/or booster. then you might readjust as described in the forgoing items. Now you are ready to talk to others, e.g. 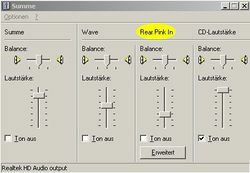 set your COM1 to the desired frequency and let your co-players praise you for that "absolute brilliant voice you have"! By the way: You do not have to wait for the next MP-event to check this real life: When flying next time, look into your pilots-list (FGFS-menu-bar --> Network --> Pilot List) and try to contact one of those pilots (or pilotesses) listed there via MPchat (FGFS-menu-bar --> network --> Chat) - via this chat you then can define what frequency to use - to be sure you tune to the same. In general all of those having FGCOM operational will gladly help you testing! You may have to look in MPmap first to find where there are some people - because you need a distance less than 100 nm to get into contact via MPchat. PLEASE: While "on Air" in MP keep the PTT pressed only while actually talking - and never longer than about 20 sec. After some time you will be timed out anyhow - but even before that drastic cutoff you might give your co-players a chance to reply/say something! Microphone not plugged or Mute-Key activated: It sounds stupid – but most technical problems are due to such “cannot bee”s – please: Always spend the 2 sec. to check this first! Also some Microphones do have an own "Mute-Key", which sometimes is not obviously to see - check your handbook if your Mic has such a switch. Plug/Jack connections are often the cause for trouble: Try to re-seat your plugs and (if possible) try to use another jack (after cleaning the plug!). If you use USB-headsets you might first try to get FGCOM running with standard Input/output devices – and go back to USB after that. If nothing else it helps to narrow down into the trouble-area! 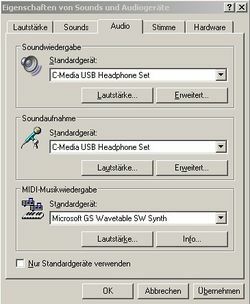 For basic systems you might use a right mouse-click onto the loudspeaker-symbol in the upper or lower position of you screen. for XP: Left mouse-click onto “Start” then on “Run”, type “SndVol32.exe” into the appearing input-field. For some “highly sophisticated (and expensive)” sound-cards you might need to use their unique descriptions. Most PC's are set up that you need to keep your PTT (PushToTalk) button pushed as long as you talk. But there are also sound-cards which open for talk with the first push/release and close it with the second push/release. Test your system how it works (may be while trying to record something or while testing according to the above). 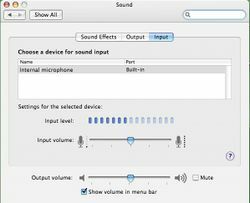 After starting the FGFS click onto “File” in the FGFS menu-bar, then onto “Sound Configuration”: Adjust the upper slide-control to a proper volume. Be aware that this setting will get lost when you exit via “X” - always exit via “File” → “Exit/Quit”. To the opposite you may adjust the volume of your FGCOM by changing the “-o” and/or “-i” options to values between 0 and 1 (see the FGOM command at the beginning of this wiki-page). Try to keep in mind: FGCOM is proven to work! So if there are problems look also for surrounding PC-features like unique hardware, software, etc. The system wide OpenAL-soft configuration file may be /etc/openal/alsoft.conf or similar. It usually contains comments describing all possible configuration options. 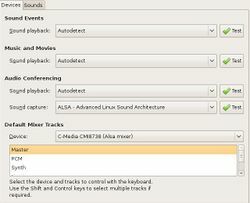 For audiophiles using Linux ALSA and with their custom $HOME/.asoundrc file preventing DMix usage, make sure you have both specified "device = plug:dmix" as well as "capture = plug:dsnoop". Per ALSA's page, "dsnoop is the equivalent of the dmix plugin, but for recording sound." Without specifying using dsnoop for the capture device alongside your $HOME/.asoundrc file preventing DMix usage, you will likely only get silence played back when usage FGCom. FGCom is not working at this point, as the sound device is likely still locked by your $HOME/.asoundrc file and only recording silence or playing back silence during the echo test! Just remember to also uncomment layout_surround51, and note the likely fact FlightGear is still only using Stereo sound (or two channel audio) and is only set here for an example! Please be aware that FGCOM is used on many very different PC's, Notebooks, etc. under very different Operating-Systems and with very different Sound-Cards. So the following basic concepts may not fit your actual system 100%. In addition you may have to check your actual System and/or unique Sound-Card manuals! For each task you can open a selection-menu (on the right the downward arrow) in order to select the wanted device. I suggest to first try setting all to "Autodetect". Then click onto the green "Test"-button. If you need to make changes, reboot the PC after each change! See the two Tabs (in the picture) Audio and Stimme (voice), you need to change in both! Switch between "Output" and "Input" and select the wanted device('s) in the field "Chose a device...". If you did change these device-settings, it is a good idea to reboot the PC and retest the settings prior to continue. 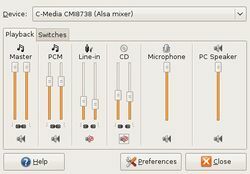 The amount of the slider-controls vary depending on the capabilities of the sound-card or the usage of USB-headsets. The “booster” is available under “Switches” (you may have to activate it first under "Preferences"). In this example the card overrides the std. Microsoft “Mic.” with “Rear Pink In”. Be aware of such changes caused by usually “high expense” devices! The “booster” is available under options. Use the above shown window to adjust. There is no basic recording program available with OSX. This page was last modified on 1 January 2015, at 14:38.